After the first official Goan newspaper Gazeta de Goa (1822) was stopped in 1826, Bernardo Francisco da Costa, impressed by the power of the press in Europe, launched the first private newspaper in 1859 called O Ultramar. He achieved much good through the newspaper by reducing taxes and doing away with the health tax. Since the paper was the voice of Partido Ultramarino,the party da Costa belonged to, O Partido Indiano, the opposing party, began A India Portuguesa. The mid nineteenth and early twentieth century was the era of migrations to British India. Bombay became home to many Goans at this time and consequently there rose the strong presence of the Goan press in the city. From 1831 to 1861 there appeared newspapers such as O Investigador Portuguez em Bombaim, O Indio Impartial, O Observador, A Abelha de Bombaim and others to keep the Goan immigrants abreast of political happenings, fire up nationalistic zeal and feed the need for constitutionalism. One of the longest running periodicals of this time was Anglo Lusitano which addressed the conflict of Padroado Real and Propaganda Fide. It was banned for a time in Goa. Fr Antonio Xavier Alvares was one of the two editors to be charged with seditious writing by Gomes da Costa in 1895. This led to the ban of newspapers functioning in Goa for almost two years. Fr Alvares was a prominent Goan journalist who, after falling out with the Archbishop, entered the Syrian Orthodox Church in Ceylon (Sri Lanka). He strove mightily for those mired in poverty and was outspoken about the few in power lining their own pockets with government funds, through his papers O Progresso, The Times of Goa, A Cruz, A Verdade and O Brado Indiano. A name that must be mentioned in line with journalistic work is Luis de Menezes Bragança. With a mind that drew prodigiously from the library he possessed, this self-educated journalist poured out his vision for a secular republic, even before Portugal acquired the status, in the newspapers O Heraldo, O Nacionalista and O Comércio. He started O Debate in 1911 and used it to promulgate ideas of freedom in terms of religious thinking, free press and nationalism. He wrote for O Pracasha, a Portuguese and Marathi weekly, and as the champion of the Konkani language he also started Amcho Ganv, a weekly, from Goa. Bombay and Poona were the nurturing grounds of Konkani newsprint. The first Konkani periodical Udentechem Sallok (The Lotus of the East) was published in late 1889 in Pune by Eduardo Jose Bruno de Souza. He used the Marian alphabet that he devised as a continuation of the sixteenth and seventeenth century method of writing the Konkani script. The medium was used to attempt a standardisation of Konkani written in the Roman script. Most lower class Goan Catholics had but a limited fluency of English and Portuguese (basic Portuguese acquired in primary schools in Goa) which made it necessary to reach out to them in a language that united them. Therefore, Konkani in the Roman script was the domain of Goan Catholics. A periodical such as Udentechem Sallok was not representative of popular readership, keeping in mind its target readers and that it was limited to content that was far from evocative of leisure reading, carrying information from almanacs, intimations about church feasts and other news about Goa. Besides, the content was highly erudite, such as the grammatical analysis of Fr Thomas Stephens’ Doutrina Christã, which was unlikely to appeal to the common man. The identity of the Goan newspaper was further complicated by the presence of newspapers in Portuguese, Konkani, Marathi and English. There is evidence of Portuguese language newspaper readership across Goa and Bombay. These newspapers were, however, a reflection of the caste system and the atmosphere of conflict among the different classes of migrants, since it was the elite Goans who admitted a proficiency of the language. One has to remember that Marathi and Portuguese were used by the high caste Hindus and Catholics, and were the official languages in the academic, administrative and literary spheres in Goa. Konkani was in a sense relegated to be the language of the cook, the maid, the butler and the tailor. But Konkani newspapers had their advantage in acclimatising the less fortunate Goan migrants to the socio-cultural environs of Bombay, while distinctly maintaining their identity as Goans. The disparity between the elites and lower classes is evinced by language and content, where the more intellectual Portuguese and English readers professed a more serious readership. No doubt Konkani newspapers carried popular fare aimed at the average reader, nonetheless they awakened the lower classes to the prevailing political situation. During this time there was a rapid appearance and decline of many newspapers. Many of these were bilingual (Portuguese-English) or trilingual (Portuguese-English-Konkani). O Luzo-Concanim was a Konkani-Portuguese weekly that was started in 1891 and edited by Aleixo Caitano José Francisco. 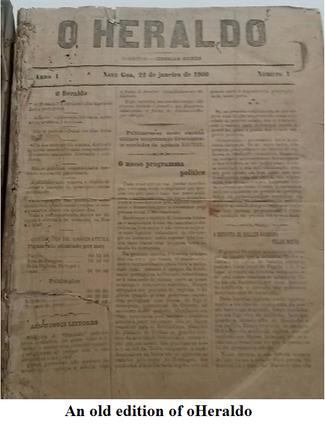 Between 1892 and1897 there were bilingual weeklies such as O Luz, O Opiniao Nacional and others. B F Cabral was the editor of Sanjechem Nokhetr (1907) which can be considered the first Konkani newspaper. Published in Bombay, it contained more news about the city than about Goa. O Goano was a weekly which began being published in the same year and was a trilingual paper with material in Portuguese, English and Konkani. It was started by Honorato Furtado and Francis Xavier Furtado. Post Liberation Goa saw a plethora of publications in English, Marathi and Konkani make their appearance, and while most faded away, pre-Liberation era newspapers such as Herald (English) and Vauraddeancho Ixtt (Konkani weekly) persist. With the declaration of Konkani in the Devnagri script as the official regional language, Roman script Konkani papers slowly vanished, leaving behind Vauraddeancho Ixtt and Gulab. Herald’s Amcho Avaz is the latest addition to the meagre store of Konkani (Roman script) newspapers in the state. Goa and Portugal: History and Development by Charles J. Borges, Hannes Stubbe. Goa: A Daughter's Story by Maria Aurora Couto. Behind the News: Voices from Goa's Press edited by Frederick Noronha. A Comparative Linguistic and Cultural Study of Lexical Influences on Konkani – PhD thesis of Madhavi Sardesai. Lecture by Dr Rochelle Pinto titled At Home in Bombay – Reading Konkani Newsprint.